Figure 4.38 (a) Bullet perforating bone; (b) entrance in bone; (c) exit in bone. difference in appearance of entrance and exit wounds is best seen in the flat bone of skull. As the bullet enters, it creates a round to oval sharp-edged hole in the outer table of the skull, with a large, bevelled-out hole on the inner table. When the bullet exits the cranial cavity, the inner table is the entrance surface and the outer table the exit surface. Chips of bone can flake off the edge of an entrance hole. This flaking is usually very superficial and should not lead to confusion with an exit hole. Coe reported a number of cases (all but one involving contact wounds) that showed partial or complete beveling of the outer table of bone at the entrance sites.18 The beveling is of such a degree that it easily could be ascribed to an exiting bullet (Figure 4.39). Such entrances should not be confused with exits, as examination will show beveling of both the inner and the outer tables. Since Coe's original paper, a number of confirmatory reports to his observations have appeared. While this phenomena can occur in both distant and contact wounds, it is more common with the latter. Differentiation of entrance versus exit often is not possible in the case of paper-thin bones such as the orbital plates or the temporal bones of children. In both instances the bone is too thin for creation of the funnel-shaped wound tract that makes differentiation of entrance versus exit possible. 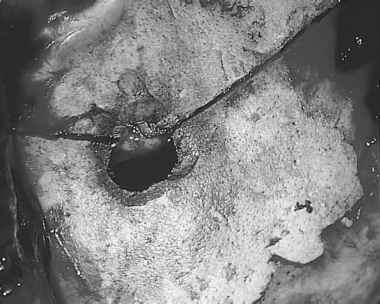 When a lead bullet perforates bone, it often leaves a thin deposit of lead on the edges of the entrance hole. This thin gray rim should not be confused with the wider zone of powder blackening seen in contact wounds overlying bone. Examination of the entrance with a dissecting microscope will readily differentiate lead from soot. Figure 4.39 Contact entrance wound of bone with external bevelling. As a general rule, after striking or perforating bone, bullets are not deflected from their original trajectory through the body. The only commonly encountered exception involves a bullet that has exhausted virtually all of its forward velocity at the time it hits the bone. In such instances, the bullet is usually found within an inch or two of the impact point on the bone. The author has seen two rare cases of bullets deflected by bone that do not fit this latter scenario. Both involved gunshot wounds of the legs. In both these cases, the victims were shot in the thigh with full metal-jacketed 9-mm Parabellum bullets. In both instances, the bullet struck and fractured the femur and was then deflected straight upward through the muscle, paralleling the femur, for a distance of approximately 6 inches. In one case, the bullet severed the femoral artery, causing death. The recovered bullets were flattened along one surface like a ricochet bullet. Teeth, like bone, show a sharp-edged, punched-out appearance on the entrance surface and beveling of the exit surface when a bullet perforates them.